For the longest time, my husband has been wanting to make a cream of broccoli soup. I wasn’t sure he could successfully make a vegan cream of broccoli soup. He totally outdid himself with this vegan creamy broccoli soup! Despite the name, this healthy soup has no cream! This soup is really easy to make too. 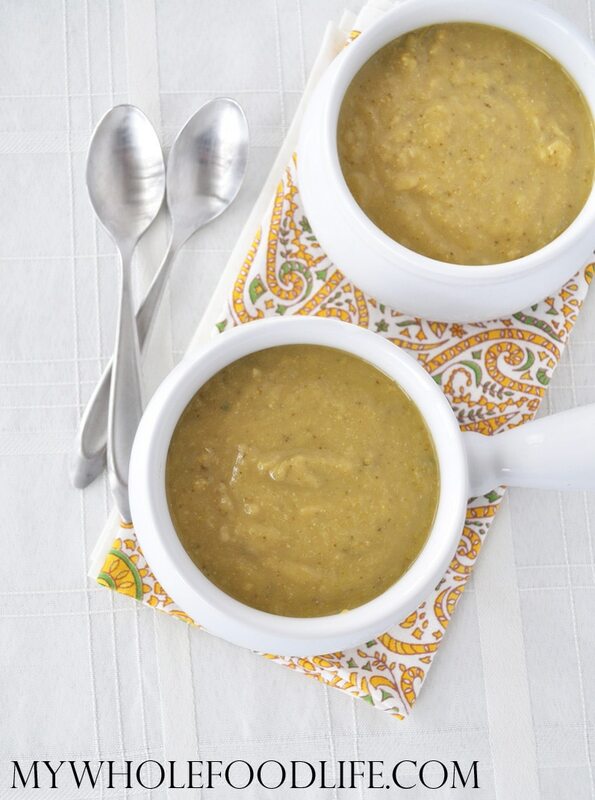 If you are a fan of soups, you may also like this post full of healthy soup recipes. I used almond milk in my recipe, but you could also use full fat coconut milk for an extra rich texture. Another option would be to top this with a cashew cream. Yum! This cream of broccoli soup is vegan and gluten free. I added some nutritional yeast for a slight cheesy flavor. I cooked this on the stove top, but you can also cook this soup in the crock pot as well. A healthier version of the classic recipe! Put all the ingredients, except the almond milk, in a large pot . Cook covered on med-low for 2-3 hours. Once the soup is broken down a bit, you can use an immersion blender to puree it. If you don't have an immersion blender, transferring it to a regular blender may work too. Once the soup is pureed, add the almond milk. Mix until well incorporated. I like to refrigerate/freeze these in serving sized portions so I can just grab out what I need. This soup should last a week in the fridge and up to 6 months in the freezer. Enjoy! So you cook the broccoli, onion and celery without any additional liquid? I know it sounds weird, but it cooks on medium low. Also the veggies will release a lot of water. Nevermind! My husband forgot to tell me he did add 2 cups of broth to this. I have edited the recipe. Sorry for the confusion! Yum, I haven't had cream of broccoli soup since finding out I was allergic to dairy, but this will definitely be changing now! Can't wait to make it! Awesome! I hope you enjoy this recipe! I have been making Broccoli Soup for years. I do not use the whole head of broccoli, but I DO use the ends. I prefer to steam the florets for dinner. I peel the ends, cut off the tough ends of the stalks and cut them into large chunks. I add vegetable broth (1 container) an onion, quartered, and 2-3 cloves of garlic. I cook it for 20 minutes, cool it, puree in a blender. I put a few steamed florets on top when serving. Hi Melissa, This looks wonderful. Will you please clarify for me 4 big heads of broccoli...is that 4 huge-separate heads that I would buy at the grocery store? Hope that this question makes sense. Thank you, love your recipes, and Merry Christmas! The heads we got were 2 heads wrapped together with a rubber band. We got 2 of those. I hope that helps! Sorry about that. I meant one week. That is what I get for trying to write with a sick baby at home. Do you think coconut milk would work? Love your recipes!